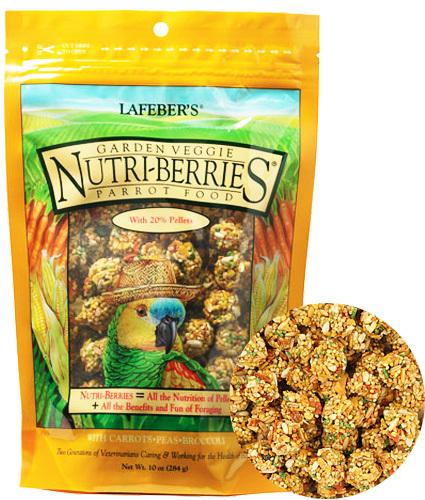 Lafeber's Gourmet Nutri-Berries Garden Veggie a garden of goodness. It's a principle as old as nature itself. Birds, are intuitively attracted to what's good for them. Garden Veggie Nutri-Berries are chock full of good things for your bird. Wholesome, inviting vegetables like carrots, green peas, broccoli and corn, together with other nourishing ingredients like safflower, red millet and hulled oats. They're all rolled into an inviting berry shape that birds find irresistible. More than just healthy vegetables, Garden Veggie Nutri Berries are designed to be a 100% nutritionally complete meal. They provide your pet with all 40 nutrients recommended by avian veterinarians as being essential to a bird's health.